The specified file public://inline-images/china #3.jpg could not be moved/copied because no file by that name exists. Please check that you supplied the correct filename. World stocks traded mixed on Friday, with risk appetite dampened despite Apple crossing a $1 trillion market cap and boosting tech stocks around the globe, after Wilbur Ross warned there’s "more pain ahead" unless China changes its economic system adding to trade war tensions, pushing the Yuan as low as 6.91 after the lowest PBOC fixing since May 2017. And while there were no fireworks in Japanese bonds overnight for the first time in a week, this time it was Italian bonds that tumbled with 10Y BTP yields rising briefly above 3% ahead of a budget meeting between the country’s populist leaders and the finance minister. The MSCI All-Country World Index was down by 0.1% after the start of European trading, and set to break a four-week streak of gains. S&P 500 and Dow Jones index futures were both flat ahead of the U.S. jobs report, which is expected to show unemployment ticking modestly lower. 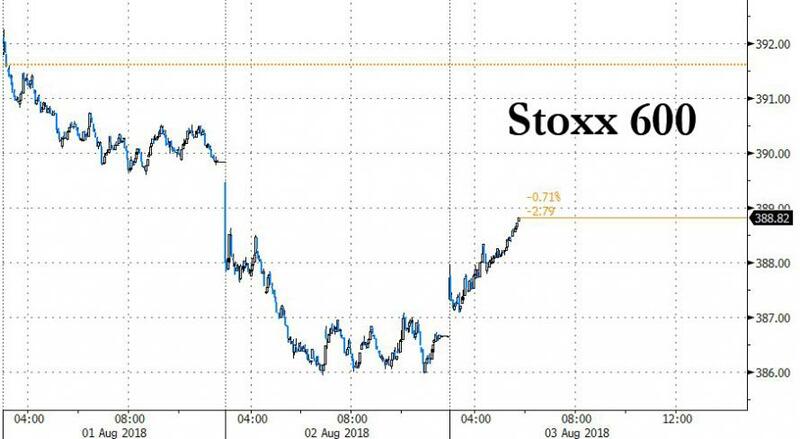 The Stoxx Europe 600 Index advanced for the first time in three days, powered by a rally in autos, tech and banking stocks after Credit Agricole SA beat earnings estimates while RBS announced its first dividend in 10 years. Italian bonds slumped for the third day as Italy officials are set to meet on the budget today where populist leaders Di Maio and Salvini have pushed "Tria’s back to the wall" with their budget requests, according to La Stampa. Italin 10 year yields broke above 3 percent for the first time in nearly two months following a report by La Stampa newspaper that the gathering would take place at 11 a.m. Economy Minister Giovanni Tria is under pressure from the government's populist leaders to raise spending and challenge European Union budget rules. The possibility that he might be forced to resign has investors worried that Italy could go on a spending binge, or even that fresh elections could follow. That in turn could strengthen the hand of the eurosceptic League party and its leader, Matteo Salvini. 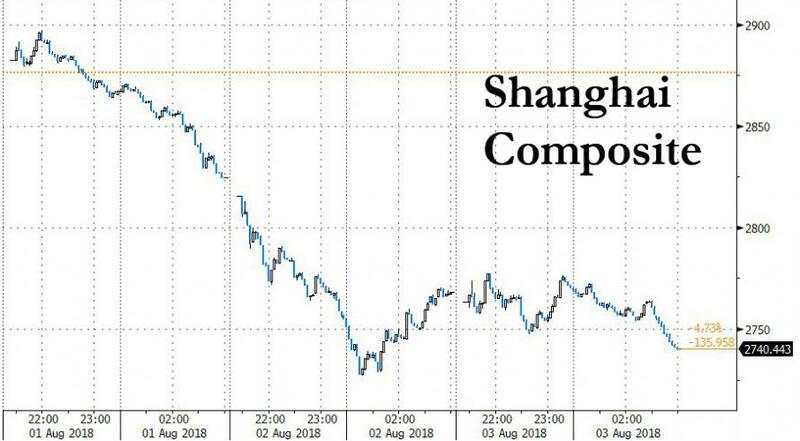 “Clearly, this is about the fear that Tria gets kicked out, which could lead to a collapse of the government, new elections, and the League gaining even further,” said Commerzbank strategist Christoph Rieger. “Or it may mean that they agree on a budget that’s at odds with the EU,” which would imply heavier borrowing and greater bond supply. 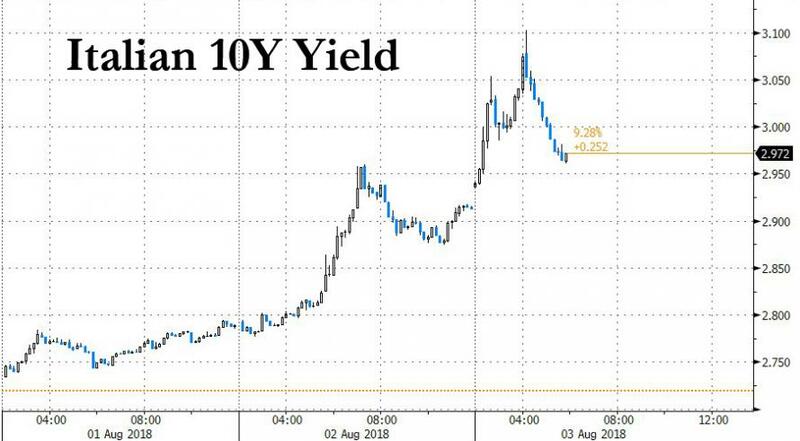 Yields on 10-year government debt rose as much as 19 basis points to 3.10%, rising above 3% for the first time since June 11 with the spread over those on their German peers rising 20 basis points to 264 basis points. While Italian bank stocks fell 0.8% on the yield rise, set for their worst week since early June, the consequences of the BTP selling - which was compounded by a lack of liquidity - have been largely contained to Italy, with European stocks ignoring the potential fallout from today's meeting. Earlier in Asia, despite Wall Street's tech-led rally, gains were capped by the trade tensions. MSCI’s broadest index of Asia-Pacific shares outside Japan was up 0.05% though it was down over half a percent on the week. Hardest hit again was China's stock market, as the Shanghai Composite dropped another 1%, approaching one month lows. 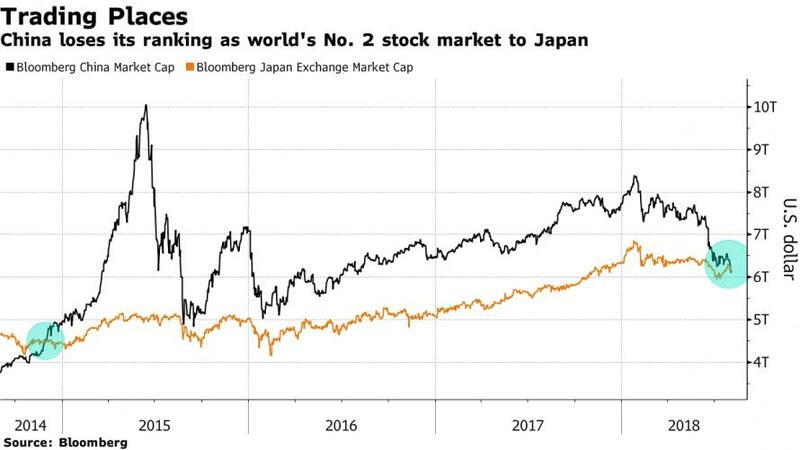 It has been a week for notable inflection points, and one day after Apple surpassed the $1 trillion market cap, China also lost its ranking as the the world's #2 stock market to Japan. 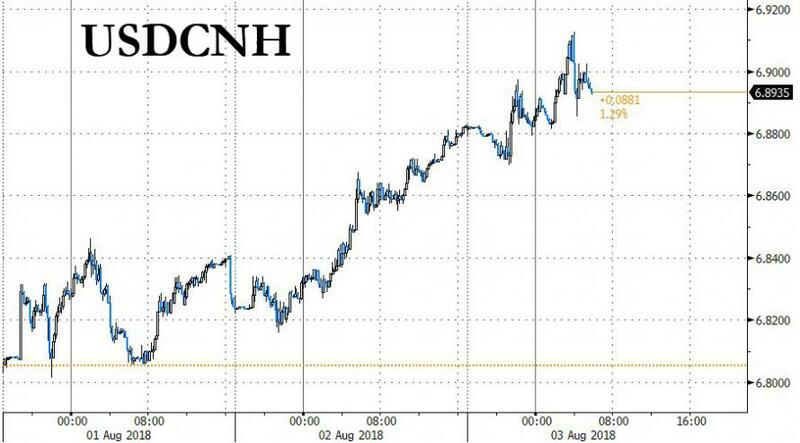 Meanwhile, the all important Chinese devaluation - which as a reminder if Beijing's currency war response to Trump's trade war - continued apace, when the PBOC weakened its daily reference rate by 0.56% to 6.8322, lowest level since May 2017. As a result, the onshore yuan is headed for an eighth week of declines, the longest stretch of weekly losses since the start of China’s modern foreign exchange regime began in 1994, amid speculation policy makers would tolerate currency weakness as China-U.S. trade tensions worsen. The offshore Yuan was also poised for an eighth straight week of losses, longest such streak on record; currency falls 0.10% to 6.8897 per dollar, after sliding as low as 6.9127, and is set for 1.2% weekly loss. Elsewhere, Turkey’s lira, bonds and stocks extended their slide after the U.S. imposed sanctions on two government ministers over the detention of an evangelical pastor. Trump's unpredictability on trade has kept markets on the back foot for the second earnings season in a row, even against the backdrop of a mostly positive earnings season and an upbeat assessment from the Fed earlier this week. Of the 397 S&P 500 companies that have already reported earnings this season so far, about 82% managed to beat analysts’ estimates, higher than the 72% beats seen during the same quarter last year. Investors were also cautious before the July U.S. jobs report due later in the day. This will give a reading on the health of the world’s largest economy, now in its second longest expansion on record. Consensus expectation is that 190,000 jobs were created in July (see full preview here). “The stock market trend continues to be characterized by a struggle between trade war distress, growth risks and strong corporate Q2 reports,” SEB analysts wrote in a note to clients. According to Bloomberg, mentions of tariffs in S&P 500 company earnings reports for the second quarter have more than doubled from the first quarter of this year. In commodities, oil prices eased back slightly after the previous day’s rally, which was driven by an industry report suggesting U.S. crude stockpiles would soon decline again after a surprise rise in the latest week. Brent crude futures were down 0.4 percent at $73.17 a barrel after surging 1.5 percent on Thursday. Copper on the London Metal Exchange slipped half a percent to $6,107 per tonne. With trade tensions hurting demand, the industrial metal was down 2.8 percent for the week. Expected data include trade balance, non-farm payrolls, and of course unemployment, and PMIs. Berkshire, Dish, Kraft Heinz, and Noble Energy are among companies reporting earnings. European equity markets have opened the day higher as the focus remains on earnings. The AEX (+0.5%) is the outperforming bourse buoyed by the news of Heineken’s (+2.3%) USD 3.1bln tie-up with China Resource Beer. The DAX (+0.5%) is also performing well after a positive earnings report from Allianz (+0.7%), but the bourse is finding resistance at its 100DMA of 12,573.54. RBS (+3.0) is up after news within their positive earnings report that they are set to pay their first dividend in over a decade. William Hill are down over 7% after the betting co. reported a pre-tax loss for H1 as a result of the new laws on betting terminals. In FX, the Dollar remains in the ascendency, albeit off best levels, but NFP will likely determine the next big move, and especially wages after Wednesday’s broadly upbeat assessments of the economy. GBP - The Pound has extended its post-BoE declines as Governor Carney underlined benign if not outright dovish policy guidance during a BBC radio interview and also expressed discomfort about growing risk of a no deal Brexit. Cable dropped below 1.3000 in response and was hardly helped by a relatively big UK services PMI miss, but stopped just short of the 2018 base around 1.2960 at 1.2975. EUR/JPY - The single currency has also relinquished another big figure level vs the Usd and has seriously tested a key 1.1575 Fib after mostly softer than expected Eurozone services PMIs and retail sales. For the record, 1.1510 is the low so far this year. Usd/Jpy extremely restrained between 111.80-60 and flanked by hefty option expiries at 112.00 (1.8 bn) and 110.90-111.00 (1.3 bn), plus 1 bn from 111.40-50. TRY - The Lira slumped to fresh all time lows vs the Usd yet again (5.1125) before gleaning a degree of comfort from not so inflated CPI readings and reports that a meet between US Secretary of State Pompeo and Turkey’s Foreign Minister was constructive – Usd/Try currently around 5.0800. In commodities, both WTI and Brent are seeing mild profit taking ahead of the weeks end, with WTI breaking through its 50DMA to the downside in early European trade, currently trading at USD 68.59, with news that China's Unipec is suspending imports of US crude oil on growing trade tensions between Beijing and Washington failing to offer support. In the metals scope, Gold is essentially flat, with traders holding off ahead of the US employment report later in the day, but is languishing around a 1 year low, with the yellow metal heading for its 4th weekly loss. Silver is also heading for its 8th weekly decline amid trade tensions, and set for its longest consecutive decline since late 2000. 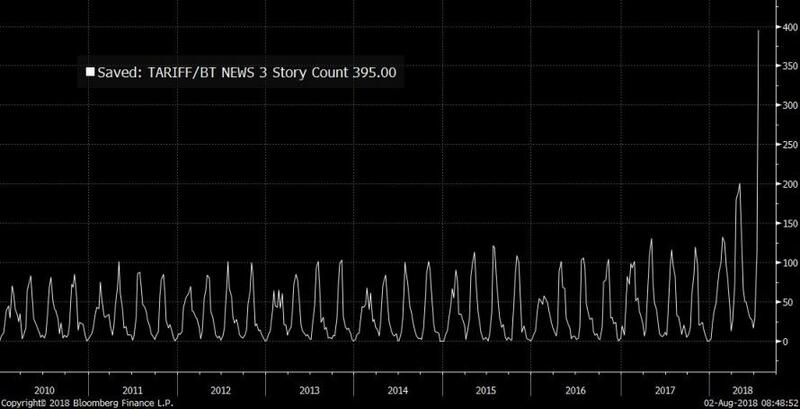 OPEC July crude output up 340k BPD at 32.66mln BPD, compliance is at 105%, Saudi Arabian output near an all-time high, Kuwaiti, UAE and Iraqi output at its highest since December 2016, Iran at its lowest since January 2017, as according to Platts. In terms of the day ahead, the July employment report in the US is due in the afternoon. Elsewhere in Europe the final services and composite PMIs are also due along with June retail sales for the Euro area. In the US, the other data includes the final July services and composite PMI prints along with July ISM non-manufacturing composite. Berkshire Hathaway will report its Q2 earnings. In Southern Europe the temperature will possibly get close to 48 degrees C today and tomorrow in some parts. If Apple could come up with iNanny I think they’d be the first $10 trillion company. For now they have to make do with being the first trillion dollar US company after yesterday’s +2.92% climb. For the record US Steel was the first to hit $1bn in 1901. It then took 54 years for GM to be the first to $10bn in 1955, another 32 years for IBM to reach $100bn in 1987 and now 31 years for the latest landmark. For the record Microsoft was the first $500bn company in 1999. Apple’s landmark coincided with a tech-led rebound after a soft Asian/European session. The S&P 500 opened -0.60% on the latest overnight trade escalations but then climbed all day and closed +0.49% led by IT (+1.37%). The NYFANG index also closed +2.93%. A common theme in recent weeks is for Asia and Europe to struggle on trade war headlines but for the US to break the shackles and shrug off any weakness and recover. DB’s Oli Harvey put out a blog highlighting that in the latest S&P market attributes report for June, it was noted that US share buybacks hit $189 billion in Q1, surpassing their previous record in Q3 2007. Buyback and decent earnings are continuing to allow the index to defy trade war gravity although the fact that we’ve been range trading since the end of January suggests that the tug of war (trade vs buyback/earnings) hasn’t necessarily seen a clear structural winner as yet. In reality the US equity market has struggled to break out on the upside since payroll Friday brought us the vol shock 6 months ago this week. Average hourly earnings haven’t really broken out after the spike that day, but they remain a crucial part of the employment report out today on what could be the hottest day ever in some parts of Europe. Good luck keeping cool if you’re in one of those affected areas. In terms of expectations, market consensus is for a 193k payrolls print which compares to the above market 213k in June, while the unemployment rate is expected to nudge down one-tenth to 3.9%. The earnings data should be the main focus though with average hourly earnings expected to come in at +0.3% mom. Our US economists are forecasting the same for earnings which would keep the annual rate steady near +2.75% yoy. Our team are slightly below market on payrolls at 180k but that’s still more than indicative of the ongoing tightening in the labour market. So all eyes on that at 1.30pm BST. Going into payrolls this morning in Asia, markets are trading mixed with the Nikkei (+0.14%) and Kospi (+0.52%) up modestly while the Hang Seng (-0.13%) and China's CSI300 (-0.49%) are both weaker. Meanwhile 10y JGB yields are slightly lower while the Chinese Yuan is c0.4% weaker and heading for an eighth weekly decline – the longest streak since 1994. As for data, the July composite PMIs for China (Caixin) and Japan (Nikkei) have both eased modestly from June, printing at 52.3 (vs. 53.0 previous) and 51.8 (vs. 52.1 previous) respectively. 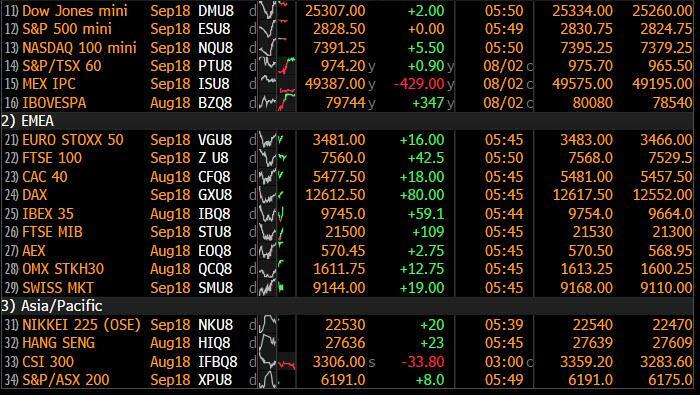 The moves this morning follow a fairly turbulent Asian/European session in markets yesterday as markets deliberated the latest US-China tariff threat. Europe initially followed Asia in selling off from the get-go with the likes of the DAX (-1.50%) falling by the most since early July. Europe didn’t rally much into the close as the US recovered well from opening losses. Bonds were a bit more of a sideshow with Treasuries (10y -2.0bps) edging back below 3.00% while Bunds were -1.7bp lower. It was hard to ignore the move for BTPs however where 2 year yields shot up +20bps for the biggest sell-off since June 21st. General negative risk sentiment appeared to play a part as did the absorption of some Spanish supply, however some uncertainty leading into a Budget meeting between Finance Minister Tria and Deputy PMs Salvini and Di Maio last night also seemed to be a factor. Now turning to some of the US / China trade headlines. Yesterday China’s Ministry of Commerce noted that “China is fully prepared and will have to retaliate to defend the nation’s dignity….” while a member of its State Council Wang Yi said “we hope that those directly involved in the US trade policies can calm down…” On the other side, the US Commerce Secretary Ross seems to have maintained his stance as he told Fox news that “we’ve to create a situation where it’s more painful for them to continue their bad practices than it is to reform”. As for the impacts on the US economy, Mr Ross noted that a 25% levy on $200bn is $50bn per year on a $18trn economy, so even if the levy was passed, “it’s not something that’s going to be cataclysmic”. Elsewhere Bloomberg cited unnamed US officials who noted that the US is open to new formal talks with China, but Beijing must agree to open its market to more competition and stop retaliatory measures. So lots bubbling along till the end of the public comments period in the US on 5th September. As for the last central bank meeting of the week, we have to admit the market reaction to the afternoon BoE meeting was a bit of a headscratcher. There was certainly no surprise in the decision itself to raise the Official Bank Rate 25bps to 0.75% and the highest since 2009 although you could argue that the 9-0 unanimous decision by the MPC was more hawkish than what the market expected. The CPI forecasts were similar to the May projections for this year and next despite the softer CPI data recently while the statement also continued to emphasize labour market tightness. The R* was estimated at between 2% and 3% but caveated by de-emphasizing it from the forward guidance and also stating that the near term neutral rate is likely to be lower. Governor Carney’s press conference itself was mostly uneventful also with the Governor reiterating emphasis on a tightening labour market and also mentioning a pickup in unit labour cost growth. So in light of the above it was a bit of a surprise to see Sterling drop -0.84% yesterday versus the Greenback, while Gilt yields also headed south with 10y yields in particular down over 5bps from their intraday highs at one stage, before selling-off a bit into the close to finish broadly unchanged. So markets certainly didn’t agree with the upbeat view and part of that view is perhaps based around the BoE’s assumption of a smooth Brexit – clearly still the big elephant in the room. Our UK economists viewed the minutes of the meeting and the latest Inflation Report to be on the hawkish side of expectations. However, they noted that a combination of rising uncertainty due to Brexit and slowing inflation should curb the BoE’s appetite for another move in rates this year. On the former, the Bank will want to get some view of the direction of progress with regards to Brexit talks before pulling the trigger on the next hike. Refer to their note for details. Away from the BoE, yesterday’s economic data in Europe included a slightly higher than expected PPI reading for the Eurozone, which came in at 0.4% mom (vs. 0.3% expected) and lifted annual inflation to 3.6% yoy. Excluding energy, the increase in the index was a bit more restrained at 0.2% mom and 1.6% yoy. Meanwhile the July UK’s construction PMI rose 2.7pts mom to 55.8 (vs. 52.8 expected) - the highest since May last year. Over in the US, the June factory orders rose 0.3ppt mom to an in line print of 0.7% mom. The final readings on the June core durable goods and capital goods orders were both revised lower to 0.2% (vs. 0.4% previous) and 0.2% (vs. 0.6% previous) respectively, although growth in capital goods still rose 7.8% yoy. Finally the weekly initial jobless (218k vs. 220k expected) & continuing claims (1,724k vs. 1,750k expected) were slightly lower than expectations and remain at low levels. In terms of the day ahead, the July employment report in the US is due in the afternoon. Elsewhere in Europe the final services and composite PMIs are also due along with June retail sales for the Euro area. In the US, the other data includes the final July services and composite PMI prints along with July ISM non-manufacturing composite. Berkshire Hathaway will report its Q2 earnings. In Southern Europe the temperature will possibly get close to 48 degrees C today and tomorrow in some parts. All time records could be broken!! And to think here in the UK we have been moaning about temperatures in the low 30s of late!! Good luck.